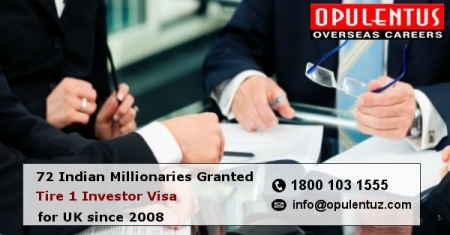 The figures provided by the UK Home Office confirm the fact that 72 Indian millionaires had migrated to the UK, availing the benefits of Tier 1 Investor visa since 2008. This reveals that migrants have contributed in a significant manner to the economy and can be seen as another sign of the positive developments taken by the business community in the country. 72 millionaires from India availed the Tier 1 visa, and many citizens from India reach the UK on the Tier 2 visa (General). Through these, the skilled workers are in a position to work, for a UK based employer, who has a Tier 2 sponsorship license and can get PR Status. India heads the list of the nation whose millionaires migrate to the UK through the Golden Visa route. Such millionaires were accompanied by 84 dependent persons. As per the Official data, and nationality identification, besides the Indians, visas in Tier-1-investor category, are immensely popular with Russia, China, and the USA, based entrepreneurs too. Their love for the country and a variety of investments has made a major contribution to the growth of the economy in the UK. In November 2014, the investment required for a Tier 1 investor visa category was merely £1 million. This threshold was of no help, and was subsequently enhanced to £2 million consequent to a review was conducted by the Home Office in February 2015. This visa allows the foreigners to invest £2, or £5 or £10 million in the UK economy. This Investment leads to PR Status for visa holders and also for their dependents for, a period of two/three/five years, based on, and commensurate with the quantum of investment done. Britain has derived several benefits buy sing the Tier 1 visa, but Transparency International is concerned about this issue. It says that it is being used for wrong purposes like money-laundering and seeks strict checks on those who apply or invest. It urges Britain to adopt effective and appropriate steps and not allow the country to become a haven for shady individuals, who go for investing avenues or for money laundering. Through this, they intend to seek an opulent lifestyle and remove the stigma from their reputations. The government in Britain should not attract such persons to obtain the UK residency and not endorse or legitimize their attempts. The appeal of the Tier 1 investor visa is receding as per the data. This is because of the enhanced investment (£2 million). Golden visa is attractive for all investors and fares well when the visa schemes pursued by other nations like the USA, Portugal, and Australia, are considered. Britain figures high because it has certain positive features like age long connections, political stability, liquid economy, and a good reputation among the nations. Moreover, there is non-interference from the UK government in private assets. If you are looking to Migrate to UK, get in touch with Opulentus, a top company for services in the field of immigration, to apply for a visa.Please contact us at [email protected] or call us 1800 103 1555. Our experts will meet your expectations and provide answers to queries.